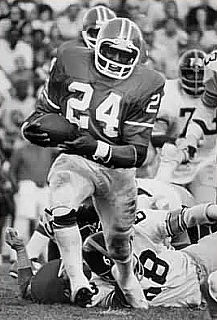 Armstrong rushed for 3315 yards in college and, as a senior in 1972, was a consensus first-team All-American and placed eighth in Heisman Trophy voting. The Broncos chose him in the first round (ninth overall) of the ’73 NFL draft and he saw limited action as the backup to star HB Floyd Little. Tried at fullback in 1974, he took over at halfback when Little was injured. Broncos went 7-6-1 to finish second in the AFC West. Armstrong was sidelined by a rib injury that cost him ten games in 1975, and he carried only 31 times for 155 yards and caught one pass. He bounced back in’76 to rush for 1008 yards on 247 attempts (4.1 avg.) and catch 39 passes for 457 more yards, and was named to the Pro Bowl. An ankle injury limited Armstrong to 489 rushing yards in the 1977 AFC Championship season and his production remained similarly low for the remainder of his career, which ended with the 1980 season. Overall, in eight years with the Broncos, Armstrong rushed for 4453 yards on 1023 carries (4.4 avg.) and caught 131 passes for 1302 yards, scoring a total of 32 touchdowns.